Happy Valentine's Day my lovely, love loves! How are we this morning/ afternoon/ evening? Me... feeling full of l'amour surprised The Husband with breakfast this morning... heart-shaped eggs in a basket (like in Carey's photo above, but not nearly as pretty) and a big ol' cuppa Barry's Tea. And as soon as I hit publish on this, I'll be moving into the kitchen to bake a batch of cookies stuffed with Nutella (the way to The Husband's heart is definitely through his belly). But tonight the candlelight la-di-da romance will be put on hold in favor of a comfy, cozy night with pizza (Thursday nights are pizza night in The LPV), beer, and an all new episode of Southland. It doesn't get much more romantic than watching Ryan from The O.C. battle LA's gangbangers while swigging Stella. candlelight la-di-da or comfy coziness? We call those toads in a hole. Looks good. I've made the cookies and will spend it with the kids and grandkids. They'll love the cookies, but I ate so much of the dough, I don't want any cookies. We call them egg in the hole and I never thought to use a cookie cutter for adorable shapes. That is NOT me being douchey, I think it's wicked cool and will now be on a eternal hunt for cool cutters to make the most awesomest egg in the hole. Happy love day to you beautiful! Sam, it's not you being douchey, it's you being all lovey-dovey and crap tonight. Not that I can say anything, I'm on the same teacup-ride of hormones and emotions. Blech. Enjoy the la-ti-da of it all! definitely comfy coziness! :) love your nutella cookie idea, what recipe do you use? That was supposed to say Joyeuse Saint-Valentin! Down with iPads! 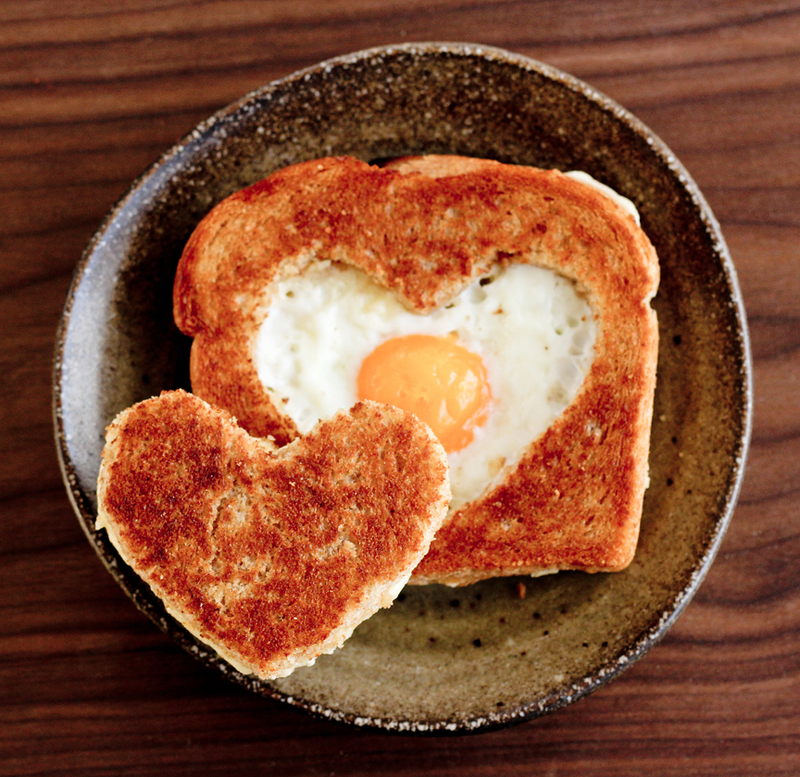 Heart-shaped eggs - I'm sure yours were just as good as this cute picture! I'm sure le Husband was very impressed! You've inspired me. I'll make cookies this afternoon - heart shaped. An evening at home with my Terry tops any evening on the town; although we are going out for a simple dinner at our local favorite. Your breakfast dish was really cute. Have a happy Valentine's day! YES SOUTHLAND is heaven. Gosh, I was such a Seth Cohen fan when I was growing up, but Ryan is such a delish and talented guy that I have a biiiig crush on him now. Yum. Oh yes, Happy Valentine's Day! Enjoy your evening! We will definitely have a comfy and cozy evening too! We will catch up on the shows we missed and eat lots of stuff! What a romantic you are! The best gifts/surprises are those that are home made and come from the heart! I'm sure that G was very happy! We will be entertaining a full restaurant tonight at our Bistro Des Copains. Joyeuse St Valentin! Today I am feeling mostly single lol But love the breakfast in bed. Now are there any of those cookies spare? oooh a little bit of both. I wish I could just spend the next 24 hours cuddled on the couch with my Michael... but tomorrow's Friday. LAME. Hope you both had a wonderful evening... everyday is valentines day! Thank you for your blog comment! I hope you had a Joyeux Saint Valentin as well. I lived in Rouen last year for a semester, and I consider myself a Francophile of sorts so your blog is great. I only visited Nice once but I dream of exploring Provence more!! Hipe you had a fantastic holiday! Mine was nice and relaxing at home. Sara, if you can't find Cream of Mushroom soup for your Tuna Noodle Casserole, saute lots of mushrooms in butter until soft, add whatever herbs you want (thyme is good), then add cream or whole milk and let it cook down a little. You can substitute this for the soup. (It's the recipe that I used, but didn't recognize,) once the whole thing is baked with the noodles, it will absorb the extra liquid. This recipe had basil (one tea) and red pepper flakes (1/4 tea.) for "adult flavor". Now I get to vicariously live through you in France. You have a sweet life! Similiar to you, our daughter is engaged to a German and is living in Germany. Different country, but all the same. Um, cutest Valentine's Day breakfast ever! I hope you guys had a wonderful date night together! This is so cute! My dad always called this meal chicken in the barn, so I love hearing all of the other names that people have for it. Sounds like a perfect Valentine's Day evening you two had! We too had pizza because it's February, it's cold and pizza should be served every night with booze. It's the only way to warm up! Speaking of O.C cast members, did you hear that Blair Waldorf and Seth Cohen are dating?!?!!? Like in real life, not fan fiction. I literally shouted OMG when I read it on Pop Sugar!